Spencer Crain Marks was born on 7 March 1840 in Montgomery, Alabama, at Pike Road. William Mathews Marks and Catherine Ann Crain appeared in the US federal census of 1 June 1850 in Montgomery, Alabama. Other members of the household included Spencer Crain Marks, James Marks, Mary Louise Marks, Samuel Blackburn Marks and Elizabeth Thornton Marks. He married Laura Hall Snodgrass, daughter of John Atkinson Snodgrass and Amanda Hall, on 1 October 1862. Spencer Crain Marks and Laura Hall Snodgrass appeared in the US federal census of 1 June 1870 in Montgomery County, Alabama, and also three servants.. Other members of the household included William Mathews Marks and Mary Ellen Marks. He was a commission merchant, according to the 1870 census. Spencer Crain Marks and Laura Hall Snodgrass appeared in the US federal census of 1 June 1880 in Montgomery, Alabama, at Bibb Street. Other members of the household included William Mathews Marks and Spencer Crain Marks. There is an 18-year-old nurse in the household, and Laura Marks is enumerated three households away, apparently in error. He was a commercial merchant, according to the 1880 census. in July 1880. Spencer Crain Marks and Laura Hall Snodgrass appeared in the US federal census of 1 June 1900 in Montgomery, Alabama, at 520 Bibb Street and one female domestic servant.. Other members of the household included William Mathews Marks and Ethel Marks. He was a cotton factor, according to the 1900 census. Spencer Crain Marks died on 12 January 1904 at age 63 in Montgomery County, Alabama. His wife Laura Hall Snodgrass became a widow at his death. He was interred at Oakwood Cemetery, Montgomery, Alabama. MARKS, SPENCER CRAIN, banker, was bom at Pike Road, Montgomery CJounty, March 7, 1840, and died in Montgomery, January 12, 1904; son of William Mathews and Catherine Ann (Crain) Marks, the former a native of Oglethorpe County, Ga., who removed to Alabama in 1820 with his parents, located in Montgomery County, and became one of the wealthiest planters of the State and brother of Samuel Marks (q.v. ); grandson of Nicholas Meriwether and Ann Paul (Mathews) Marks, the former a native of Fredericksville Parish, Albemarle County, Va., who removed to Broad River settlement, Ga., and shortly after his marriage to Montgomery County, where he acquired extensive and valuable property, the latter the granddaughter of Gov. Mathews, of Georgia, and of Spencer and Mary (Tomkins) Crain, of Montevallo, Jasper County, Ga; great-grandson of James and Elizabeth (Harris) Marks, the former a native of Albemarle County, Va., and magistrate of this county in 1873, who removed to Wilkes County, Ga., where he became a well known member of the Broad River settlement; great-nephew of John Marks, a captain in the Revolutionary Army, who married Lucy Meriwether Lewis, the widow of William Lewis and mother of Meriwether Lewis, the explorer, of Peter and Joanna (Lydwor) Marks, the former ???????????? ?eecheater of Albemarle County, Va., and of Hastings and Ann Scott (Jefferson) Marks, of the tide water-district of Virginia and the latter the sister of President Thomas Jefferson; great-great-grandson of John and Lady Elisabeth (Hastings) Marks, the former a native of Suffolk, England, who emigrated to America and settled in Albemarle County, Va., and of John and Martha (Gaines) Marks, the former a native of Oargunnock, Sterlingshire, Scotland, who emigrated to America and located at Aberfogle, Albemarle County. Va., lived for a while in Richmond County, Va. and was King's attorney of Amherst County, Va., from 1761-68. Spencer C. Marks was educated in the public schools of Montgomery, attended Dr. Henry Tutwiler's school at Green Springs for three years, and was a student at the University of Virginia, graduating in 1860. He left on the breaking out of the War of Secession, returned to Montgomery and joined the First Alabama cavalry, under Gen. James. 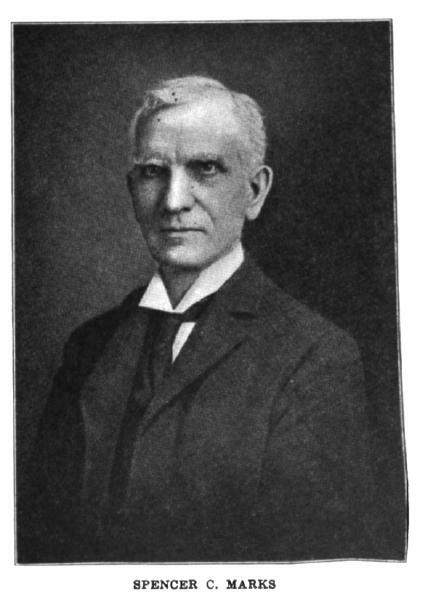 H. Clanton. After the war he engaged in the cotton business as a member of the well known firm of Marks and Gayle. He was the first democratic treasurer of Montgomery County after reconstruction days; was a director in the Merchants and planters, Farley national and the Fourth national banks, and for many years served as Junior warden of St John's Episcopal church. Married: October 1, 1862, at Montgomery, to Laura Hall, daughter of John Atkinson and Amanda (Hall) Snodgrass, of that place. Children: 1. William Mathews, m. at Raleigh, N. C, to Jane Hawkins, daughter of Col. A. B. and Julia M. (Johnston) Andrews, the former 1st vice-president of the Southern railway at the time of his death, and granddaughter of Col. William and Ann Eliza (Graham) Johnston, of Charlotte, N. C; 2. Spencer Crain, d. young; 3. Ethel m. Guy R. Brightwell, of Mazeys, Ga. Last residence: Montgomery.